Apple has had a Safari 4 Beta out for a few weeks now. Should you wish to try it out on your Mac, a word of warning: installing this version utterly messed up my Mail, in particular my IMAP accounts. I blew away all traces of the accounts and recreated them from scratch in Mail. That didn’t help, nor did any of various other cleanup operations. Uninstalling it made my problems disappear. It is possible this problem is specific to me (such a critical problem would have raised louder howls!) or I am misdiagnosing it (one is a browser and the other a mail client). So usual acronyms apply: YMMV, FWIW. Available for Mac OS X and Windows, if you want to brave it! UPDATE: The problem was incompatibilities between Safari 4 and one of my Mail Plugins (Proxifier), which I was not using anyway. I removed /Library/Mail/Bundles/Proxifier and all is well! Looks like NewsFire has gone free a la NetNewsWire. 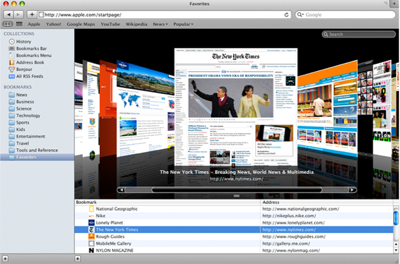 I downloaded and played with it for a while, and while it is impressive, I do not plan on switching from NetNewsWire. One nice feature that NewsFire does have is that when a feed (in the left sidebar/column) has no unread articles, NewsFire moves it to the bottom of the list. I would like such feeds to be entirely hidden, as Google Reader does, but this NewsFire feature is at least better than the lack of any such feature in NetNewsWire or other readers. If you are looking for other free options for a Mac RSS reader I also recommend Vienna RSS reader.